Discovery in community is how we grow in our faith through service to our neighbors. 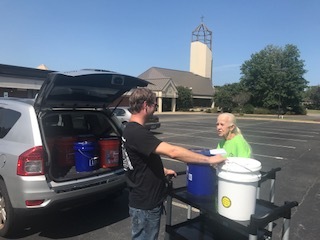 We offer opportunities throughout the year from short term mission projects, collection drives, aiding relief efforts for natural disasters, and ongoing ministries like the Dignity Food Pantry. One community group we partner with is the John Rolfe Family YMCA through the Bright Beginnings program. This year we are helping to provide clothing and companionship to eleven young people to feel confident as they get ready to go back to school. We’d be happy to help you discover more today.